There are countless different options available for storing data online, but most of these can be quite costly, but have you ever considered using your Gmail account for this? Gmail comes with buckets of storage, at the moment Google are giving you a very generous 7.5GB, and if you use that up you can still get more for very little. Most of you will never use that up since emails are very small in size, so why not take advantage of all that free storage. How would you like to turn your Gmail account into a makeshift storage device? 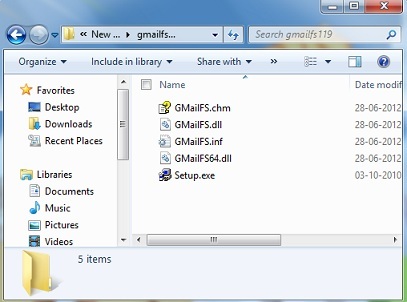 Download this cool little file called GMail Drive Shell Extension and extract it to your desktop or where ever you wish. It will then flash some terms and conditions at you, close them and your all Done! 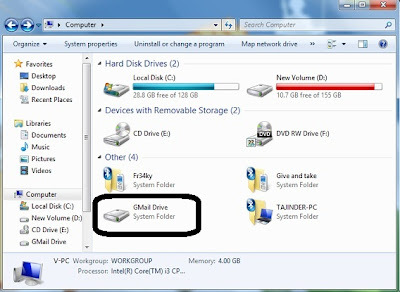 Now go into My Computer and you should see a new drive there called GMail Drive. Simply double click on it and enter in your Gmail log in details and away you go. All you have to do is copy and paste or drag files into that folder and they will be automatically uploaded to your Gmail account and arrive in the form of an email. It’s quick, simple and easy, a great way for you to access your documents on the go and in one handy place.